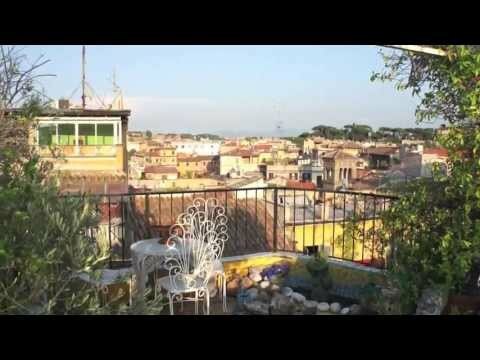 An Attic Apartment For Sale in the Antique Trastevere District of the Historic City of Rome next to the Tiber. The Apartment is on three floors with the the top a floor terrace is a tiled floor of the '600 and with a 360 degree view the River, St. Peter’s, the Roman Forum, an the ancient district. Enter the home with a large living room with fireplace, two bathrooms with Indian Mogul bath complete with columns, frescoes with Indian motifs, gold taps, Jacuzzi, bathroom with Chinese furniture, lamps and paintings with Chinese motifs, gold taps, Jacuzzi, a double room , one single bedroom - wardrobe, loft studio, professional kitchen with tiled floor of 600, winter garden with veranda fully opened, sitting area with bay window round super panorama, palace of the '50s lift entrance with mosaics d 'era. Taxi and bus in front of the palazzo & a parking garage is around the corner. It is authentic art apartment renovated by its owners - interior designers with original and ancient and modern materials of great value. The Attic is 'very sunny and offers views of the Roman Sunrise and Sunsets. On request, Being Sold Fully or Partially furnished.